I am thinking this will be my one and only post this week... I am taking my 70 year old mother, my nearly 70 year old aunt, my sister and her friend, Ashley and myself to Memphis to do all the Elvis stuff! It's a girls only trip! My cousin Nathan is a Broadway dancer who happens to be performing in Wicked while we are there so we will be seeing him as well! 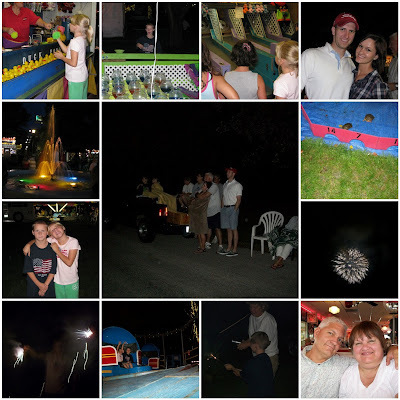 Enjoy this mosaic of a small town Fourth of July celebration! Your mosaic is great, Terri. Have a wonderful adventure!!!! Fun photos on your mosaic. I'm so glad your 4th was good. I'm so glad you're going to Memphis. We're going later this month and will see Graceland for the first time. Can't wait to hear all about your trip. Take notes for me. Looks like a FUN mosaic! Sounds like a fun trip...Elvis and Wicked! Have fun! I'm going to see "Wicked" next Wednesday in San Francisco! I can hardly wait...I heard it's really good! Cool mosaic. Have a rockin' good trip! Although we might be having a blue July without you! But, please, don't feel like a hound dog for abandoning us. We want you to have a good time. I also loved your mosaic of the 4th!!! I've never been to Memphis--we need to make that a destination some day! How cool to have a cousin as a Broadway dancer--especially in Wicked! I look forward to your photos!! I am sure you all are laughing lots and having a wonderful time. Does this mean that summer school is done? Splendid job on the mosaic! Sounds as if I'm going to be reading about your trip momentarily because I know that you've posted again. I usually have a lot of catching up to do. Today, I blatantly copied something that I love that you did with your chalkboard. Those intersecting vines...love them! Mine didn't turn out nearly as well as yours, but it was still an improvement from what I had done.